Blend/Mix flavors or crumb toppings into the home-made consistency shake product as it is dispensed! 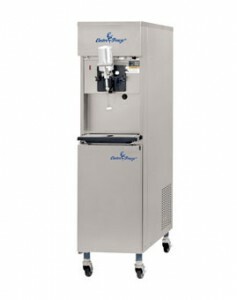 This extreme-volume, pressurized shake freezer features a dispense-head-mounted mixer that blends flavors and/or crumb toppings into the shake product as it is dispensed, producing a high-quality, hand-made shake consistency. The fast, easy way to serve flavors regardless of the viscosity of the flavoring syrup or the fruit pulp it contains. Great for ice cream stores and QSR’s that want speed of service with the highest quality of shakes available.